Ah. The holidays are upon us. They may be the best time of year and full of good cheer. But the added demands of the season can overtax our bodies and seriously compromise our health. Chiropractic research shows that the holidays can induce stress and unhealthy behavior patterns that can manifest as back pain, neck pain, and headaches. Worse, this stress can build within the body and contribute to such major ill-health conditions as depression, obesity, heart disease and diabetes. 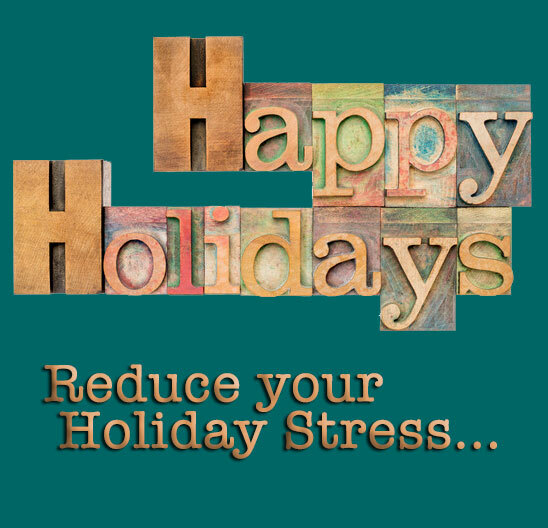 In an effort to promote health and wellness this holiday season, the American Chiropractic Association (ACA) offers tips on how to manage seasonal stress more healthfully. The key to beating holiday stress, it turns out, is to prevent it. And the key to preventing it is being realistic about what to expect. 1) Lifting Holiday Items such as packages, firewood, Christmas trees, and frozen turkeys. When lifting heavy, bulky items, hold them close to your body, rather than flexing forward. And lift with your legs, not your back. Maintain a slight arch in your lower back and bend at the knees before standing with the object. 2) Standing for Longer Periods when waiting on cashier lines and cooking holiday meals. Relieve tired back and leg muscles by elevating one foot at a time—about six inches with a foot rest at home, with another package while shopping. This will help prevent bad posture that can lead to abnormal spine curvatures. 3) Sitting for Longer Travel Times. On a long car or plane trips, place a small pillow or folded towel behind the small of your back to help maintain your lower back arch and properly support your body. This relieves spinal discs and joint structures of unnecessary pressure. Also, be sure to adjust your headrest to align with your head, at least up to ear level. 4) Sleeping fewer Hours. Many health problems that develop with the holidays are due simply to fatigue. Compensate for this by making a point of getting more sleep hours, if possible, rather than fewer. By simply ensuring adequate rest, you can prevent structural strain, and avert emotional and cognitive imbalances. For more information about how chiropractic care can help with your back pain please contact Total Chiropractic Care at (631) 447-2299. You can also visit our FAQ page.